Fast-forward a few decades, and Aldrete-Sanchez is a managing director and lead analytical manager for Standard & Poor’s (S&P), where he researches and rates 18,000 cities, counties, school districts, and other debt issuers across the United States. 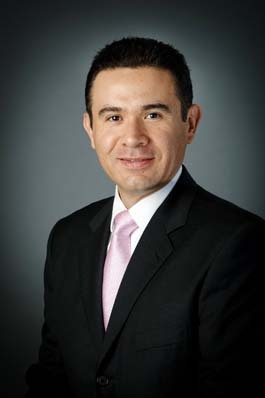 Before accepting a position with S&P 15 years ago, he worked as a director of public debt in Mexico. Today, he leverages that experience in the public realm and lessons learned from interacting with his family of origin to make crucial decisions at a top international credit-reporting agency. It’s a process that Aldrete-Sanchez still enjoys after 15 years at S&P. Looking back, he can recall small border towns that were once nothing more than dirt roads and struggling businesses that are today home to major throughways, thriving commercial enterprises, and bustling technical colleges. At one point, those cities were just plans on a piece of paper until S&P stepped in to evaluate bonds to enable financing for each project. Outside of work, Aldrete-Sanchez is a former board member and strong supporter of a Dallas-based program for underprivileged students called My Very Own Book, which places reading materials in the homes of low-income students throughout five area schools. He was attracted to the program after noticing gaps in public-sector services. “I was fortunate, because I could get books and education, but I grew up around kids that didn’t have that chance,” Aldrete-Sanchez says. By helping students take books home, he hopes to play a small part in providing the same kind of opportunities he felt lucky to have had throughout his early years.